Cathedral Green. A celebration of the very best, artists & makers based in the South West. 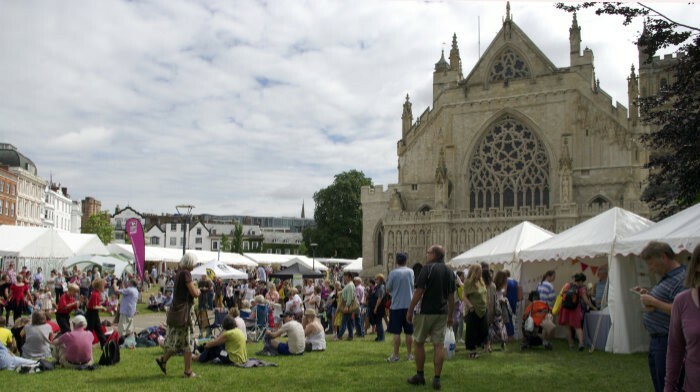 In the historic setting of Exeter’s Cathedral Green this very special event will take place over three days Thursday 4th July, Friday 5th July & Saturday 6th July. 2019. This combination of art, craft and entertainment has been an annual event for over 40 years and this year promises to be better than ever. Over 100 stalls in a unique tented village give the visitor the opportunity to see the work of the West Country’s best artists and makers. The lively, friendly atmosphere creates the perfect way to browse and talk to the makers of a diversity of work. Ceramics, textiles, metalwork, jewellery and so much more. There will also be an opportunity to see work being created. Free entertainment for all tastes abounds with Punch & Judy for the young at heart, face painting, vocalists, dancers and even a strolling jazz band. There is a great choice of refreshments too with vendors dotted around the site. A great day out, for all the family.